This course was published in the March 2017 issue and expires March 2020. The authors have no commercial conflicts of interest to disclose. This 2 credit hour self-study activity is electronically mediated. Discuss the prevalence and clinical manifestations of peri-implant disease. Describe risk factors and biological complications that can compromise implant outcomes. Explain therapeutic approaches to maintaining dental implants. This paper will review common medical comorbidities and iatrogenic risks for implant treatment, and explore prevention and maintenance of biological complications associated with peri-implant tissues. Zarb and Albrektsson3 described implant success criteria as an immobile fixture, without associated pain, discomfort, altered sensation or infection attributable to the implant. The implant placement would not preclude seating a functional prosthesis satisfactory to the patient and clinician. In addition, the mean vertical bone loss would be less than 0.2 mm annually after the first year of function. The goal of therapy is to provide restored implants that survive and function for the lifetime of the patient. Additional therapeutic goals include preventing supporting bone loss around the implant, and maintaining noninflamed gingival tissues adjacent to the abutment and restoration. This second objective does not always occur, however, as a survey of 280 U.S. periodontists by Papathanasiou and colleagues4 notes up to a 25% prevalence of peri-implant disease in this patient population. Peri-implant mucositis is a reversible inflammatory process localized to the soft tissue around the implant, and without loss of supporting bone following initial bone remodeling. Peri-implantitis refers to loss of supporting bone around the implant fixture.5 The appearance of the soft tissues and microbiota associated with peri-implant mucositis is similar to gingivitis. By comparison, the clinical appearance and microbiota associated with peri-implantitis is similar to periodontitis. It will manifest as peri-implant attachment loss, with deep probing depths and/or recession. Unless the osseous defect is a dehiscence, bone loss will be radiographically evident.6 According to Derks and colleagues,7 peri-implantitis shows a progressive pattern of bone loss. Therapeutic goals for the prevention of peri-implant disease include careful case selection relative to a patient’s medical concerns. Prudent surgical management, ensuring an appropriate occlusal load and effective oral hygiene — supported by professional recare maintenance — and a patient-cleansable prosthetic design are equally important to clinical success. The therapeutic goals associated with maintenance of peri-implant disease involve controlling inflammation, arresting the infective process, and preventing progressive bone loss around the implant fixture to facilitate survival and function. If the implant becomes mobile, it must be removed. Diabetes is also associated with lower implant survival rates. Fiorellini and colleagues10 noted a 14% implant failure rate over five years, while Tawil and colleagues11 reported implant survival rates in subjects with controlled diabetes (averaging HbA1C values of 7.2) similar to patients without diabetes. These findings suggest that patients with Type 2 diabetes can be successfully treated with implant therapy, provided their diabetes is properly managed. Addressing diabetes as a risk for peri-implantitis, Ferreira and colleagues12 found the presence of periodontitis and patients with poor metabolic control were statistically associated with greater risk of peri-implantitis. Poor plaque control has been identified as a risk factor in peri-implant disease.12 As such, clinicians should promote self-care by educating patients about the proper use of toothbrushes, interproximal brushes and dental floss. Considering the etiology for peri-implant mucositis is an accumulation of plaque, patients should be taught how to remove biofilm from the facial, lingual and proximal surfaces of the implant-supported restoration. Typically, an implant-supported crown is wider than the implant, resulting in an increased surface area of the crown adjacent to the soft tissues on the proximal surfaces of the restored implant. 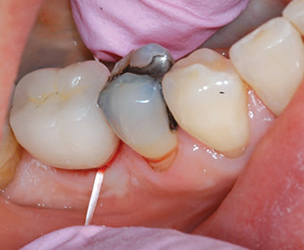 With the goal of effective mechanical disruption, the patient should be instructed to floss apically and adjacent to the undersurface of the crown bordering the soft tissues (Figure 1). 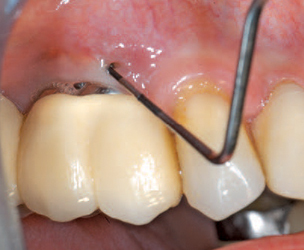 For fixed multiunit prosthesis, patients can use interproximal brushes to clean embrasures. FIGURE 1. A demonstration of flossing the apical surface of the prosthesis adjacent to the soft tissues for plaque removal. Effective self-care is key to successful outcomes. Poor prosthetic design can also compromise peri-implant tissues — and the risk for plaque accumulation increases when a fixed prosthesis has poorly designed contours that make plaque removal difficult. This includes a fixed prosthesis with closed embrasures spaces, overly contoured crowns, and restorations with excessive subgingival placement. These problems can be prevented through proper prosthetic design (e.g., cleansable embrasure spaces and emergence profiles, and limited subgingival crown margin placement). The cementation process for single- or multiple-unit fixed prostheses also poses risks for biological complications. Residual subgingival cement is irritating to soft tissues, and has been shown to increase plaque retention.13 Subsequent to cementation, every effort must be made to remove excess subgingival cement. It is advisable not only to take a post-insertion radiograph to determine if the crown is completely seated, but also to visualize if any cement has been left apical to the crown margin. Removal can be accomplished with a periodontal probe and floss. In cases with deeper subgingival crown margins, clinicians can use an ultrasonic tip to break up and flush out residual cement. The radiograph in Figure 2 is from a patient with retained subgingival resin-based cement. An abscess developed eight months post-insertion of the cemented implant-supported restoration. Clinicians can avoid this and other cement-related complication through utilization of a screw-retained prosthesis. FIGURE 2. A radiograph showing residual cement on the implant and supporting bone loss; the excess material eventually led to an abscess. Periodontal disease has also been implicated as a risk for implant failure, as microbial flora from periodontal pockets may infect peri-implant tissues.14 To reduce the risk of loss of supporting bone, clinicians must ensure proper prosthetic design and effective oral hygiene instruction. Providers should also seek to eliminate active periodontal disease via appropriate therapy. Although peri-implantitis is generally viewed as a result of an infective process similar to periodontitis, clinicians must not overlook the possibility that the etiology of the reduced bone support is iatrogenic, occurring as a result of surgical complications. This is particularly concerning in cases involving alveolar ridge atrophy that require bone grafting or immediate implant placement into compromised extraction sockets. Froum17 expressed concerns regarding implant placement in compromised sites with aggressive protocols. Initial research demonstrating successful outcomes for guided bone regeneration (GBR) occurred with primary coverage over barrier membranes that protected a clot with a stabilized volume — with or without an osseous graft.18 Machtei19 reported poor success rates with membrane exposure in GBR procedures. In some cases, the iatrogenic etiology of reduced supporting bone may be the failure to achieve primary closure over a barrier membrane, in conjunction with implant placement into an edentulous ridge. A basic principle of GBR is the exclusion of nonskeletal connective tissue via barrier membrane placement. Another factor that could lead to a compromised bone graft may be a lack of barrier membrane placement by an inexperienced clinician, as not using a barrier membrane results in failure to exclude nonskeletal connective tissue into the grafted area. Nonskeletal connective tissue cells, such as fibroblasts, will ingress into the grafted area, impairing osseous regeneration. Moreover, failure to stabilize the membrane, use of a membrane that resorbs prematurely, or pressure from a provisional prosthesis on the healing wound can also negatively effect GBR outcomes. Staging GBR procedures for atrophic ridges prior to implant placement can help prevent complications that result in reduced bone support for an implant. In the presence of a compromised extraction socket, clinicians should consider ridge preservation procedures and delayed implant placement. Two adjacent restored implants placed less than 3 mm apart will likely lose interdental bone height due to the coalescing of circumferential bone loss from each implant. This will result in a reduced interdental papillae height. Platform switching or utilizing a smaller implant diameter can help prevent bone loss. Successful implant maintenance begins with assessment at the recare visit. This includes peri-implant probing, assessing inflammation, recording bleeding on probing data, and taking radiographs for comparison purposes. Patient comfort should also be assessed. Changes in any of these values may indicate biological complications. Nonsurgical management of peri-implant disease can be achieved via continuous reinforcement of oral hygiene and increased recare visits. If existing prosthetic management makes cleansability difficult, the therapist should consider fabricating a prosthesis that is more easily cleaned. There are three chief scenarios for implant recare/maintenance visits for patients with biological complications. The first consists of a patient with peri-implant mucositis who has not experienced exposure of the abutment through gingival recession. In this clinical condition, conventional instruments used for debridement of the natural dentition or restored dentition will suffice. The second condition involves exposure of the abutment via gingival recession. Clinicians are advised to use nonmetal instruments or titanium scalers in this situation. The concern is scratching the abutment, which could encourage plaque retention.23 There is no clinical evidence, however, that scratched abutments increase the number of implant complications.24 The third condition is exposure of the implant through recession or pocket formation and concomitant bone loss. This may appear radiographically as angular or horizontal bone loss. Angular osseous loss around the implant would be associated with an infrabony defect adjacent to the implant fixture. In the third clinical scenario, recare maintenance options include treatment via ultrasonic instrumentation, titanium scalers or an air polisher with glycine powder. Although plastic scalers or plastic-coated ultrasonic inserts and tips have been recommended in the past, there is a risk for leaving shards of plastic in the pocket if they engage the implant threads. Systemic antibiotic therapy, local subgingival placement of minocycline or doxycycline hyclate, or irrigation with antimicrobials (e.g., chlorhexidine gluconate) can also be utilized in recare. There is limited data, however, on the efficacy, timing and choice of local or systemic antimicrobial regimens in managing peri-implant conditions.25 More research is needed to investigate these agents’ role, as well as the optimal type and dosage for treating peri-implant disease. Resective therapy may include a gingivectomy/osteoplasty to expose the portion of the implant that is no longer osseointegrated. The resulting exposure facilitates debridement. In 2016, Sapata and colleagues26 demonstrated that implant-plasty of the exposed implant helped reduce plaque retention. As shown in Figure 3, a patient with two poorly spaced implants presented with an abscess. Subsequent to administration of systemic antibiotic therapy, the patient returned, still presenting with fistulation and buccal pocketing associated with a buccal osseous dehiscence. Treatment consisted of a gingivectomy and debridement of the exposed threads. Oral hygiene measures were reinforced and the patient was advised to use a water flosser. At a recare visit six months post-gingivectomy, 3-mm pocket probing depths were recorded and inflammation appeared to be resolved. FIGURE 3. This patient presented with pockets and soft tissue fenestration that indicate a buccal osseous dehiscence. Regenerative therapy using open flap procedures have been reported in literature with limited success. The goal is to facilitate regeneration of bone and reosseointegration of the portion of the implant that has lost (or never achieved) bone support. There is, however, no consensus on protocols for disinfecting the exposed implant threads. Nevins and colleagues27 investigated using an Er:YAG laser to decontaminate infected dental implant surfaces and reported a positive outcome, with new bone-to-implant contact established at a level representative of the size of the defects. In contrast to previous studies, in this investigation the prosthesis was removed and primary coverage was achieved over a barrier membrane and graft material placed over a disinfected implant. Implant biological complications involving soft tissue inflammation and supporting bone loss can occur as a result of bacterial accumulation, resulting in an infectious/inflammatory reaction around implants. Smoking or diabetes can also contribute to implant complications. Peri-implantitis can result from an iatrogenic event associated with implant placement involving an inadequate assessment of keratinized tissue and bone volume. Another etiology for reduced osseous implant support may involve a compromised GBR procedure or aggressive immediate implant protocol. Recession and/or bone loss associated with an iatrogenic event can be prevented by mucogingival and osseous site preparation prior to implant placement. In addition to emphasizing the importance of self-care, it is incumbent on therapists to continuously monitor and maintain restored dental implant fixtures. Reducing biofilm loads associated with the restored implant — either through self-care, or nonsurgical or surgical intervention — is likely to reduce the risk for progressive bone loss. The first years in function are critical for implant survival, and clinicians should aim for a well-structured maintenance program in order to increase the probability of long-term implant success. Da Silva JD, Kazimiroff J, Papas A, et al. Outcomes of implants and restorations placed in general dental practices: a retrospective study by the Practitioners Engaged in Applied Research and Learning (PEARL) Network. J Am Dent Assoc. 2014;145:704–713. Zitzmann NU, Berglundh T. Definition and prevalence of peri-implant diseases. J Clin Periodontol. 2008;35:286–291. Zarb GA, Albrektsson T. Consensus report: toward optimized treatment outcomes for dental implants. J Prosthet Dent. 1998;80:641. American Academy of Periodontology position paper. Peri-implant mucositis and peri-implantitis: A current understanding of their diagnoses and clinical implications. J Periodontol. 2013;84:436–443. Mombelli A, Lang NP. The diagnosis and treatment of peri-implantitis. Periodontol 2000. 1998;17:63–76. 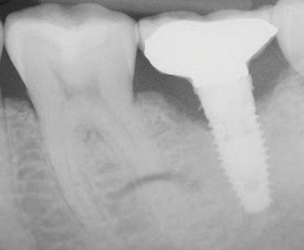 Derks J, Schaller D, Håkansson J, Wennström JL, Tomasi C, Berglundh T. Peri–implantitis–onset and pattern of progression. J Clin Periodontol. 2016;43:383–388. Bain CA, Moy PK. The association between the failure of dental implants and cigarette smoking. Int J Oral Maxillofac Implants. 1993;8:609–615. Strietzel FP, Reichart PA, Kale A, Kulkarni M, Wegner B, Kuchler I. Smoking interferes with the prognosis of dental implant treatment: a systematic review and meta-analysis. J Clin Periodontol. 2007;34:523–544. Fiorellini JP, Chen PK, Nevins M, Nevins ML. A retrospective study of dental implants in diabetic patients. Int J Periodontics Restorative Dent. 2000;20:366–373. Tawil G, Younan R, Azar P, Sleilati G. Conventional and advanced implant treatment in the type II diabetic patient: surgical protocol and long-term clinical results. Int J Oral Maxillofac Implants. 2008;23:744–752. Ferreira SD, Silva GL, Cortelli JR, Costa JE, Costa FO. Prevalence and risk variables for peri-implant disease in Brazilian subjects. J Clin Periodontol. 2006;33:929–935. Gouvoussis J, Sindhusake D, Yeung S. Cross-infection from periodontitis sites to failing implant sites in the mouth. Int J Oral Maxillofac Implants. 1997;12:666–673. Cairo F, Pagliaro U, Nieri M. Soft tissue management at implant sites. J Clin Periodontol. 2008;35:163–167. Roccuzzo M, Grasso G, Dalmasso P. Keratinized mucosa around implants in partially edentulous posterior mandible: 10-year results of a prospective comparative study. Clin Oral Implants Res. 2016;27:491–496. Froum SJ. Dental Implant Complications. Etiology, Prevention, and Treatment. 2nd ed. Hoboken, NJ: John Wiley & Sons Inc; 2016. Schenk RK, Buser R, Hardwick WR, Dahlin C. Healing pattern of bone regeneration in membrane-protected defects: a histologic study in the canine mandible. Int J Oral Maxillofac Implants. 1994;9:13–29. Machtei EE. The effect of membrane exposure on the outcome of regenerative procedures in humans: a meta-analysis. J Periodontol. 2001;72:512–516. Spray JR, Black CG, Morris, HF, Ochi S. The influence of bone thickness on facial marginal bone response: stage 1 placement through stage 2 uncovering. Ann Periodontol. 2000;5:119–128. Paolantonio M, Dolci M, Scarano A, et al. Immediate implantation in fresh extraction sockets. A controlled clinical and histological study in man. J Periodontol. 2001;72:1560–1571. Grunder U, Gracis S, Capelli M. Influence of the 3-D bone-to-implant relationship on esthetics. Int J Periodontics Restorative Dent. 2005;25:113–119. Fox SC, Moriarty JD, Kusy RP. The effects of scaling a titanium implant surface with metal and plastic instruments: an in vitro study. J Periodontol. 1990;61:485–490. Esposito M, Hirsh J, Lekholm U, Thomsen P. Diferential diagnosis and treatment of strategies for biologic complications and filling oral implants: a review of the literature. Int J Oral Maxillofac Implants.1999;14:473–490. Renvert S, Polyzois IN. Clinical approaches to treat peri-implant mucositis and peri-implantitis. Periodontol 2000. 2015;68:369–404. Sapata VM, de Souza AB, Sukekava F, Villar CC, Neto JB. Multidisciplinary treatment for peri-implantitis: a 24-month follow-up case report. Clinic Adv Periodontics. 2016;6:76–82. Nevins M, Nevins ML, Yamamoto A, et al. Use of Er:YAG laser to decontaminate infected dental implant surface in preparation for reestablishment of bone-to-implant contact. Int J Periodontics Restorative Dent. 2014;34:461–466. From Decisions in Dentistry. March 2017;3(30):44–47. Timothy Hempton, DDS, is an adjunct associate clinical professor in the Department of Periodontology at Tuft University School of Dental Medicine in Boston. He also maintains a private periodontal practice in Dedham, Massachusetts. Hempton can be reached at timothyhempton@gmail.com. Evangelos Papathanasiou, DMD, MS, PhD, an assistant professor in the Department of Periodontology at Tuft University School of Dental Medicine.